nformation, Analysis & acceptance – I think these are the process which make one acknowledging some random things. This is an ideal process for human thought process. Although there are some cases, where your practical analytical skill may tend to null, just like hearing some ghost stories from some unknown persons about an unknown place. Even if you witness some unusual things, you can never be hundred percent sure about what you’ve seen- there will be lots of confusions which will be self explanatory to you that those are not what you’re actually thinking about. In a study it has been found (42%-52%) people believe that there is something called supernatural evil power. I’m not considering you, neither mine into that category , as I’m an Engineer I believe in rational thinking, but still, we know there’re a number of people who skip the second stage – “Analysis”. For them things become clearer after getting to know about any incident, why I’m talking about this pretty reasonable, as I dont want any of my reader believe or get scared, after reading my article. Srikhola Trekkers Hut was provided with a digestive story by my trekking guide. After the story, I was not a person who believed it, because I admire Nepalese people as true devotee of God, Religion etc, so its quite fundamental that a person who believes in God, obviously will have some conception in devil. While climbing up to Gorkhe from Srikhola that day, I was extremely exhausted by yesterday’s activity, so was taking random breaks . The Sun was not so kind, i was taking random haults & was trying to engage my guide to a particular topic, so that my break-taking & his words can go simultaneously. This idea actually was not a failed one, as I was keeping my guide occupied with other activities along with my heavy breathing. So, in an intensive point, I asked him Being so aged,experienced person did he ever seen or heard of any unusual things. This question turned him on completely. What he was talking about earlier was in a normal volume & with a particular state of mind. This time he got agitated & with a louder tone nodded his head. As per the guide what I listened carefully from him – this is not a very recent incident, lots of tourist & travelers have heard about this or felt these unusual things. 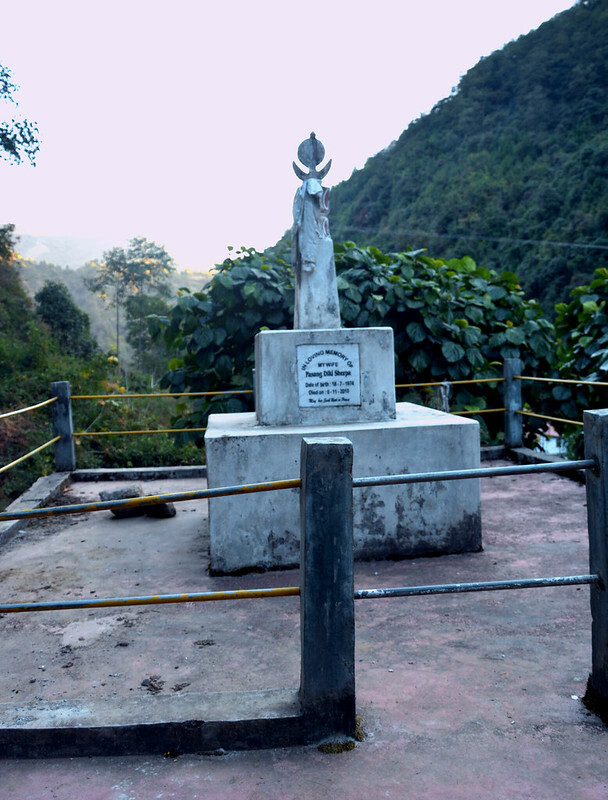 This story is about the grave of the lady just behind the trekking camp. The lady had an unusual death who was once owner of that land where today’s trekker hut is. Some heavy footsteps on the wooden stairs, wearing sandals can be heard in midnights. Although presence of no one was reported at that time on stairs or on the wooden ist floor, who had tried to find out, in curiosity or in searching for thieves. This mischievous unknown walker most surprisingly disappear every time from the stair & her favorite time for roaming is around 3AM. This was reported again and again, but its also a fact that its not for everybody who had taken a shelter in trekkers hut & felt this. Now you may be thinking of whats the big deal with this, may be sort of hallucination. Generally people often have drinks to keep body warmer, so may be out of all this, but my guide’s story was not ended here. In one night some of his friends were coming down from Gorkhey & stayed in trekker hut. They were well aware of that unusual incident, but it was just care a hang. After the dinner, they all were set to sleep. It was when midnight, one of them awoke & listened the footsteps, he half rose on bed & was thinking what to do now. Suddenly, a heavy pounds of slap on his face – made him fell on bed. The sound was so loud & heavy that everybody of the hall woke up & tried to investigate what was happening. But nothing was found, no lady with slippers, no heavy slapper. The next morning, that friend was found with high fever. This slap was not a single reported incident, there are plenty of local people who had heard or faced the slap. So, here my guide’s story was ended. Now, I’m not asking you to believe this story. Why should you have faith upon a blogger’s story which also is based upon a local guide’s information. Or may be you can find a different point from all these stated above. what ever is your inference, before making your mind, you need to know what then I was thinking about. because I was not like a person, who simply can believe upon a ghost story, so my determination was pretty strong – as my guide’s earlier quote, I was about to return to Srikhola Trekker’s Hut again after 3 nights with my friends, who were climbing down from Falut to Gorkhey. So, why not to have those evil sensations with my own organs after few nights. I was just looking for it to happen. Then I think you must be interested to read about my Horrible night spent in Srikhola which just happened after some days.